Joseph Marren's foundry was known as the Grand Central Iron Works, located at 157 E. 44th St. from 1869 to 1897. For his history and that of the Grand Central Iron Works, see the Marren page in manhole covers. 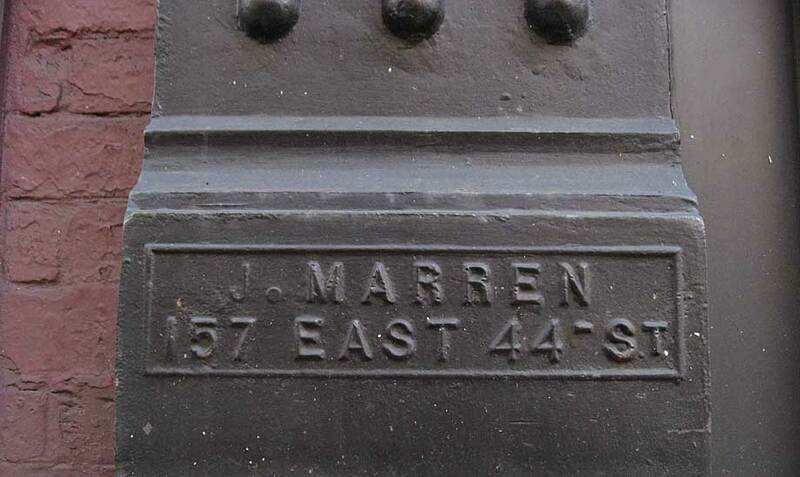 Another J. Marren foundry mark is found on East 49th St. near the United Nations. Yet another Marren mark is found at 1372 York Ave. near 73rd St. Heavily painted, it seems to read Joseph Marren / 157 E 44 St & E 27 / New York . The "E 27" is surprising. Otherwise, I have not found any evidence that Marren was located on East 27th Street. The J. Marren mark at 1834 2nd Ave. reads J. Marren / Grand Central / Iron Works / 157 East 44 St.
At least two Grand Central Iron Works foundry marks are found on Columbus Ave. All heavily painted, this one at 942 Columbus Ave. near 106th St. is one of the clearer ones.